Nov. 11, 2012 - PRLog -- Orlando, FL - Pangolin Laser Systems Inc. - the world’s leading provider of laser light show control software and hardware for the entertainment industry, was recently honored at the 2012 International Laser Display Association (ILDA) Conference, where the company and their client’s took home an overwhelming forty percent of the total awards given out this year. In addition, Pangolin clients from eight different companies then went on to win another fifteen ILDA Awards for work being done in the field of laser display and entertainment, where Pangolin Laser Control Systems were used as the primary means to create the laser show content. These awards were given in a variety of different categories, including laser graphic and abstract shows, beams and screen shows, nightclub and festival shows, live stage shows, laser used in video/film, innovative applications, and laser photography. A complete list of Pangolin client’s who won ILDA Awards at this year’s conference is listed below. 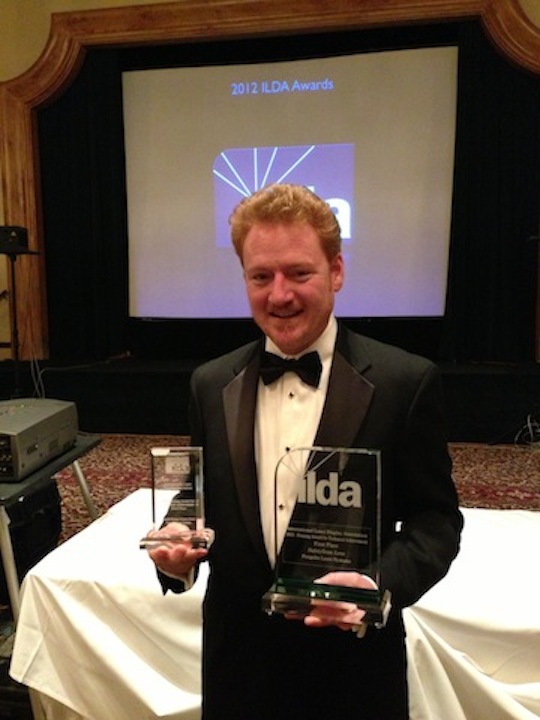 Founded in 1986, ILDA is the worldwide non-profit trade association dedicated to advancing the use laser displays in art, entertainment and education. While increasing public awareness of laser light shows, the ILDA is also an association that provides a base for laser display companies. ILDA does not perform laser light shows itself, but its members primarily consist of laser light show hosts or companies that sell equipment and services. Members of the company work with each other, not as competitors, but as colleagues with whom they collaborate. Being associated with ILDA, members can have professional backing that will supply information on new technologies regarding safety issues and improved display performance. For more information on ILDA, or becoming a member, please visit our website at www.laserist.org. Or you can visit us on Facebook at www.facebook.com/InternationalLaserDisplayAssociation. About Pangolin Laser Systems Inc. Since 1986, Pangolin has emerged as the world’s leading provider of software and hardware solutions to the laser light show industry. The company, with offices in the USA, Central Europe, and Mainland China, has received more than 22 awards for technical achievement and product quality, and their software has contributed to more than 365 Artistic Awards for its users. Pangolin has products being used by some of the largest events, companies, and brands currently known, including major theme parks such as Disney World, SeaWorld, Universal Studios, and Six Flags; major motion picture companies such as 20th Century Fox and DreamWorks pictures; high-tech companies such as PC Magazine, Boeing, and Lawrence Livermore Labs; popular brands such as Mountain Dew, T-Mobile, and Motorola; major sports teams and events such as the Orlando Magic, Philadelphia Eagles, Chicago Bulls and Super Bowl XLIV; and top-named musical talent including DJ Tiesto, Madonna, Drake, Usher, Metallica, Jay-Z, Kanye West, David Guetta, Skrillex, the Black Eyed Peas, Jennifer Lopez, Shakira, Jean Michel Jarre, Justin Timberlake and many others. With over 26 years of experience in the entertainment industry, Pangolin is dedicated to helping their clients create stunning laser light shows, and their passion for innovation is reflected in the products they release to the market. More information on Pangolin can be found on their website (http://www.pangolin.com). You can also join them on Facebook at (http://www.facebook.com/PangolinSystems. Chief Operating Officer - Pangolin Laser Systems Inc.
: Justin Perry - Pangolin Laser Systems Inc.